DisplayFormulaBar Application Property in VBA is used to hide or show the formula bar. It has Boolean value. If the value is true then it show the formula bar on the Excel screen. Else, it hides the formula bar. Please find the more information and syntax in the following chapter. Here syntax for DisplayFormulaBar Property of application object in VBA. In the above syntax Application represents object and DisplayFormulaBar is the Property of Application object. 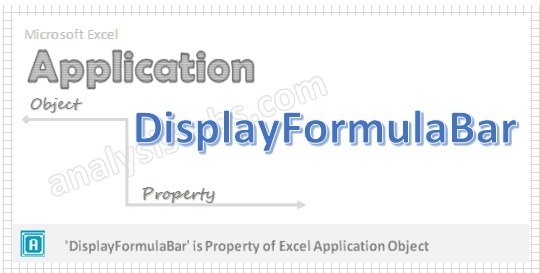 Please find the below example for DisplayFormulaBar Property of application object in excel VBA. The below example shows the formula bar in the Excel screen. Please find the below example for DisplayFormulaBar Property of application object in excel VBA. The below example hides the formula bar in the Excel screen. Step 5: Now press F5 to execute the macro code to display formula bar or not.